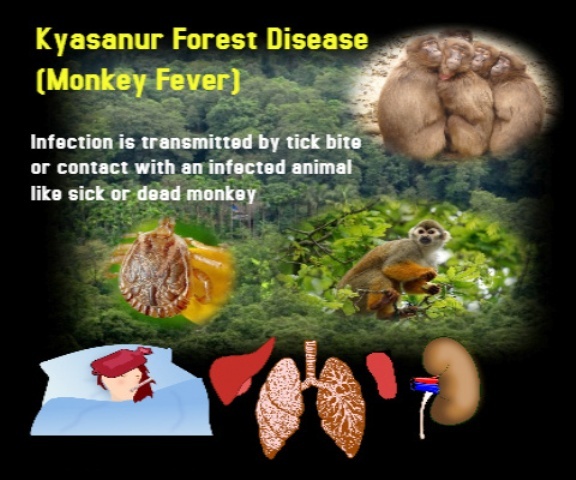 Kyasanur Forest disease (KFD) is caused by Kyasanur Forest disease virus (KFDV), a member of the virus family Flaviviridae. 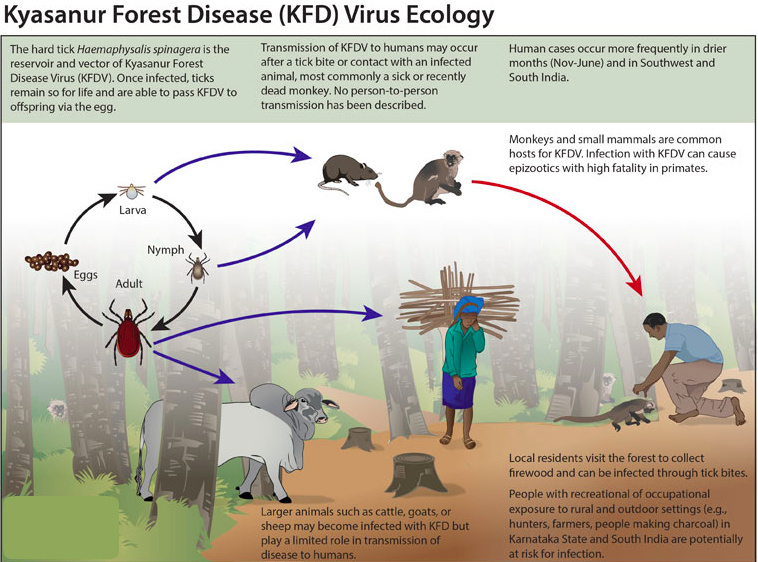 KFDV was identified in 1957 when it was isolated from a sick monkey from the Kyasanur Forest in Karnataka (formerly Mysore) State, India. Since then, between 400-500 humans cases per year have been reported. Hard ticks (Hemaphysalis spinigera) are the reservoir of KFD virus and once infected, remain so for life. Rodents, shrews, and monkeys are common hosts for KFDV after being bitten by an infected tick. KFDV can cause epizootics with high fatality in primates. 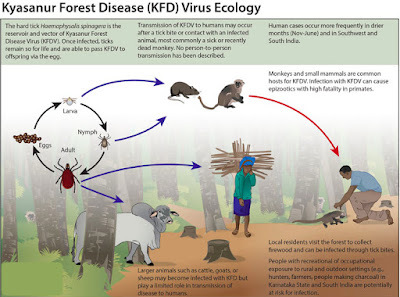 Large animals such as goats, cows, and sheep may become infected with KFD but play a limited role in the transmission of the disease. These animals provide the blood meals for ticks and it is possible for infected animals with viremia to infect other ticks, but transmission of KFDV to humans from these larger animals is extremely rare. Furthermore, there is no evidence of disease transmission via the unpasteurized milk of any of these animals. After 1-2 weeks of symptoms, some patients recover without complication. However, the illness is biphasic for a subset of patients (10-20%) who experience a second wave of symptoms at the beginning of the third week. These symptoms include fever and signs of neurological manifestations, such as severe headache, mental disturbances, tremors, and vision deficits. 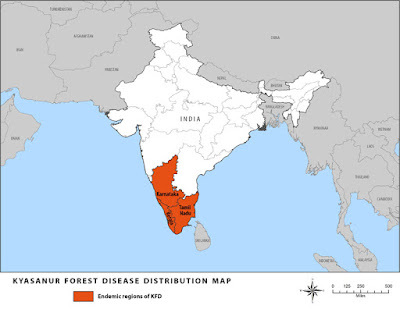 KFD has historically been limited to the western and central districts of Karnataka State, India. However, in November 2012, samples from humans and monkeys tested positive for KFDV in the southernmost district of the State which neighbors Tamil Nadu State and Kerala State, indicating the possibility of wider distribution of KFDV. Additionally, a virus very similar to KFD virus (Alkhurma hemorrhagic fever virus) has been described in Saudi Arabia. People with recreational or occupational exposure to rural or outdoor settings (e.g., hunters, herders, forest workers, farmers) within Karnataka State are potentially at risk for infection by contact with infected ticks. Seasonality is another important risk factor as more cases are reported during the dry season, from November through June. There is no specific treatment for KFD, but early hospitalization and supportive therapy is important. Supportive therapy includes the maintenance of hydration and the usual precautions for patients with bleeding disorders.